Following the traditional “ignite” format, presenters get 5 minutes and 20 slides to share their passionate teaching idea. The ten best “ignite” ideas will be selected to make their presentations “live” at WJEC-5. Click here to view past Ignite presentations. > Entry Deadline : March 1, 2019. Accepted entrants will be notified by March, 2019. What is the Ignite Competition? Following the traditional “ignite” format, presenters get 5 minutes and 20 slides to share their passionate teaching idea. 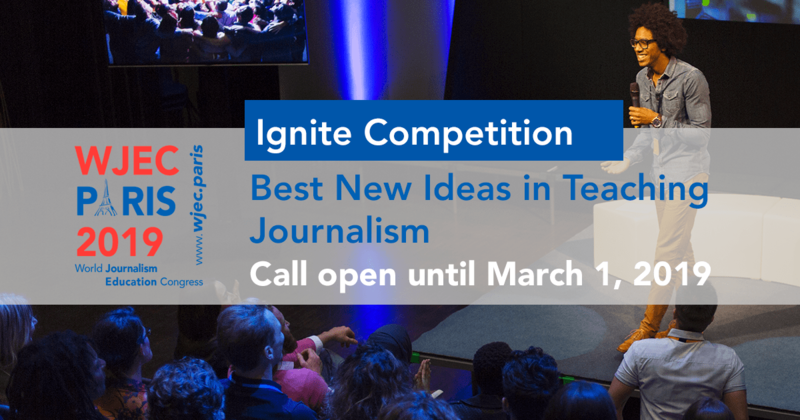 The ten best “ignite” ideas will be selected to make their presentations “live” at WJEC-5. Click here to view past Ignite presentations. To view more “Ignite” examples, click here. Slide format can be either Mac based or PC using Prezi, Keynote or Powerpoint, BUT the slides MUST be emailed in advance and are strictly limited to 5 minutes. Works should be in English or have English subtitles, or the entrant must include a narrative about the entry in English. Tell us how you think this will help other journalism educators improve their teaching. Email mdbruce@ua.edu or heather@BEAweb.org if you have any questions regarding the Ignite presentations.